I’m seeing it at 4:40 tomorrow afternoon. I have yet to read the books, although they are among my mother’s favourites. I will be sure to get back to you with a full report! Sydneysiders: Join in the fun! Americans: Envy us or revel in your fortune! The choice is yours! PS. Kon Satoshi’s Paprika is showing as part of the Sydney Film Festival. I’ve already bought my tickets. Have you? I just realised some kind soul set me to “On Hiatus” on Anime Nano. I wasn’t going mad crazy! I’m not at full steam yet, folks, but I did cover some heavy ground in the last couple of months! Heavy … wishing ground? Check it out, old friends! I miss you so much it feels like the freaking Wizard of Oz over here! On July 6, Eminence held an event at Sydney’s Town Hall in honour of the Tanabata Festival. “Spirited Away with Youmi” showcased the work of Kimura Youmi, who is best known in the world of anime fans for her song “Always With Me” (Itsumo Nando Demo) from Spirited Away. 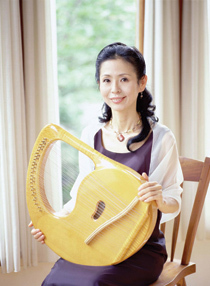 For just shy of two hours, Kimura took the stage with her lyre and performed not only “Always With Me”, but several other songs from Ghibli films, including “Princess Mononoke”, “My Neighbour Totoro” and “Sanpo” (the opening song of My Neighbour Totoro). Most interesting of the Ghibli songs was a performance of “Name of Life” (Inochi no Namae) a song written for Spirited Away that was featured in the movie as a purely instrumental piece: a piece that I would list as the defining part of the score, for the defining parts of the film. Accompanying the Ghibli songs was footage from the movies that they came from, which acted to take me out of myself as an anime fan. For two hours I didn’t care about what other people thought of what I watched: I thought about what the Ghibli films mean to me, about how perfect films like Spirited Away and My Neighbour Totoro really are. I have Ghibli fever lately, and this was a natural extension of that. This is somewhat more logical than the effect that Superman Returns had (it made me want to watch Laputa). All the same, it was strange to hear these songs played simply with a lyre, particularly as “Sanpo” had a “big band” feel in its original form, “My Neighbour Totoro” a very “produced” feel and “Princess Mononoke” was actually originally sung by a man. I was surprised too when I found out, but a man can produce notes that high. Kimura performed several other songs that were her own, as well as several traditional Japanese songs that sounded frustratingly familiar to my ear. A highlight of these songs was her performance of the gospel song “I Believe” which, due to David Lodge’s Therapy, I can never take seriously. Words aside, when Kimura got off the lyre to play the piano, she sounded as if she sincerely shared the sentiments expressed in the lyrics for one of the more impassioned performances of the night. While there was an obvious anime fan appeal to the night, the presence of Kimura Youmi allowed the event to rise above the normal “nerdishness” espoused by Eminence (honestly, most of their events are for playing the music of the Final Fantasy games, and by far their biggest coup was having Uematsu Nobu come out to perform a few years back). Town Hall was not packed to capacity, but there were several Japanese families in attendance who would have been able to appreciate the more “cultured” aspect of the evening. Kimura Youmi herself is a charismatic woman. She studied music at California State University and was thus more than adequately equipped to compere the event herself, even being so kind as to explain the meanings of several of the songs before singing them. One of her songs, “Silver Drops”, was actually performed in a mixture of Japanese and English. The English lyrics seemed banal until I listened closer to the Japanese part of the song and realised that it was just a literal translation. Japanese actions are naturally more onomatopeoically pleasing than those in English, and so the poetry of the song was lost in the singing. The end of the concert was met with a four song encore, which concluded with “Always With Me” being performed with the accompaniment of piano, two violins and a cello … and with an English translation. The way that the song is sung, it sounded almost exactly the same as it does in Japanese. The lyrics worked, but the performance of a song with choruses that amount to nothing more than “la la la la la la/ la la la la/ la la la la/ lu lu lu lu lu lu/ la la/ lu lu/ la la/ lo” isn’t in quite the right register for English performance. I prefer the song with just a lyre, because Kimura’s voice is what really carries the song and makes it transcendent, and allows Spirited Away some of the best ending credits an anime movie ever had the honour of posessing. All in all, “Spirited Away with Youmi” was a worthwhile night: a showcase of a charismatic and talented woman with just the right level of cross-demographic appeal.